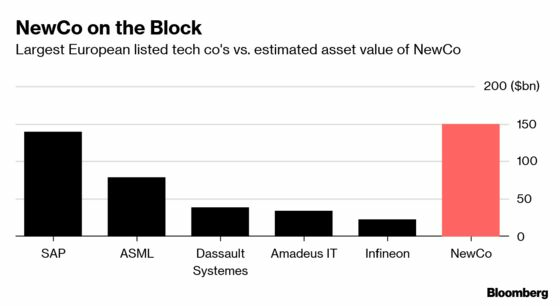 (Bloomberg) -- European-listed tech giants are so scarce they are set to be trumped in size by a newcomer that hasn’t decided what to call itself yet. African conglomerate Naspers Ltd. revealed this week that it plans to list a portfolio that includes a range of tech investments, from food delivery to online platforms for second-hand goods. The new Amsterdam-based company will also hold a massive $133 billion stake in Chinese game-maker Tencent Holdings Ltd.
By comparison, the largest tech company in Europe, at least by market value, is German software firm SAP SE, at about 124 billion euros ($139 billion). Next on the current list is ASML Holding NV, the Dutch semiconductor manufacturer, at 69 billion euros. While not a straight comparison, the fair value for the new Naspers listing could still be about $150 billion, according to Renaissance Capital analyst David Ferguson. Still lacking an official name -- currently called NewCo -- Naspers’ spin-off will be unlike any company that European investors have had access to before, at least in terms of scale. But putting a market value on NewCo will be down to investors. One of the motives for listing in Amsterdam was to try and correct the current discount to the value of its assets. Naspers is valued at around 1.42 trillion rand ($100 billion), far below the value of its stake in Tencent. The NewCo will also have a $1.35 billion stake in DeliveryHero. In January this year it took full control of Russian classifieds business Avito BB, buying the last 29 percent for $1.1 billion, giving its company a value of about $3.8 billion. It’s 28 percent stake in Mail.Ru Group Ltd. is also worth about $1.4 billion. The new company’s products are regularly used by a fifth of the world’s population, the parent company Naspers said in an investor presentation. Cape-Town based Naspers is the eight-biggest consumer internet business in the world, behind other well-known names such as Amazon.com Inc., Alphabet Inc. and Facebook Inc. The name for this new European tech play should be expected in due course, said the company. A listing will only be done during the second half of 2019.